Hmmmm I grew up in rural SW Washington State and as a kid we used to run around the woods looking for DB Cooper’s money. He, as we all know, hijacked passengers on a 727 and then ransomed them off for cash, and then jumped out and disappeared into oblivion. I hope it becomes an awesome movie someday. Unlike him I think the pilot’s goal was to land on CI while the world eyes are on SCS, what he could do next I don’t know but the primary goal was getting media attention and mocking malaysian government/military(the same thing happened only 2 weeks ago when ethiopian copilot hijacked the plane and went to Switzerland instead of Italy, unintentionally exposing weakness of swiss airforce that worked only 9-17h), that’s one of the rare differences between our thinking. It may sound far fetched for supposedly stable Captain in his years, but if he was really really mad because of that trial…human mind is sometimes very strange. 1. I have been to China probably 30 times during the last 12+ years before I retired. During some of those trips I went to Urumqi in Xinjiagn and surrounding locations. One thing is very clear, there is no problem to find a motive for the Uyghurs to do harm to the Chinese. Compared to the Uyghur/Chinese relationship, the Israelis/Palestinians can be considered best buddies. The Uyghurs will probably do whatever they can to damage their nemeses in Beijing. They have shown on several occasions that they are very determined, very savage and can be suicidal. From what I have seen, these people are also tough and smart. 2. As I understand things there were at least two Uyghurs aboard MH370 – one an artist and the other had a PhD and who lectured as an assistant professor in the Department of Electrical and Electronics Engineering, at a Turkish university. There is also an unconfirmed report that he had taken simulation flight training. 3. There are ‘out of the way’ airports in Xinjiang where perhaps a plane could land unnoticed. Some of these have very little activity, border the desert areas or are otherwise quite remote. Also, in China local civilian carriers often use military airports. At quite a few of these, usage is very light. During my work I have been to both military and non-military strips. a. Something went wrong. 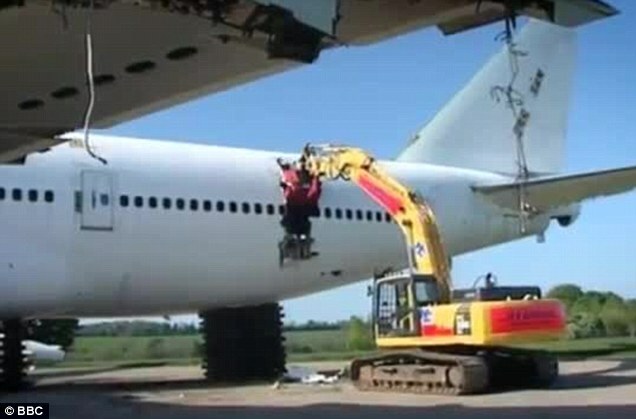 They could not get the plane operational again. Perhaps they crashed. b. The plot and the plane were discovered by the Chinese. They may have tried to free the Chinese National passengers and things went badly. If that took place in an isolated area they could have decided to keep it quiet – let the public continue to think the plane is still lost. It certainly is possible to keep things under wraps in these locations – especially with Chinese Military assistance. The Chinese have been quite silent on much of this – perhaps for a reason. c.	Perhaps something is still in the works. Hijack “Illegally seize (an aircraft, ship, or vehicle) while in transit and force it to go to a different destination or use it for one’s own purposes”. Which seems to fit what Zaharie may have done in your theory 😉 Some would say pijack = pilot hijack. But seriously, it seems to have been an intentional act (if the radar data are to be believed) and the most likely motive seems to be some geopolitical advantage IMO, although I have no idea whodunnit or why or how. As to the debris bioforensics report – that’s up to Malaysia to release and it wouldn’t surprise me if we never see it. I think ATSB is getting a lot of unwarranted flack when they are actually under Malaysia’s thumb (so to speak). Could it be that Malaysia hasn’t released the report because it doesn’t support the current search area or even a crash in the SIO, e.g. the 2 finds from Madagascar and the RR from S. Africa just don’t have the marine growth expected for that time in the ocean? @OZ: experts tell us smaller debris – from the cabin interior especially – is consistent with a high energy impact. If debris was planted, a high energy impact is what the planters wanted us to believe was indicated. I have a few questions: I recently saw pictures of the flaperon mh17 in a warehouse and it looked in pretty good shape considering the plane had been shot down….so to me mh370 flaperon looked in a lot worse shape. I’m no expert but it just seemed strange to me, did anyone else notice that, is that normal? Also I take issue with Malaysia ignoring a commercial plane flying with its trxpndr off, don’t you find that odd. They ignored it because it was commercial and it was their airliner….how did he know it was their airliner if trxpnder was off and was only a blip on military radar screen? Sounds fishy to me. GortoZ – you said the data was telling us something else? What is that something else? It all doesn’t make sense to me. Also I thought that in the beginning the oringial inmarsat data said the last ping was at 00:11, now its 00:19 for whichever TZ they are using. Anyhow it appears to me a lot of info in the radar used mimics that of ek343 flight and it landed at 00:19, doesn’t anyone else find that strange? Just curious as I never was one for coincidences? If the plane did indeed go to SIO as so many say, and it broke up in 10,000 pieces, controlled ditch and sank, which is it? can’t have it both ways? The debris turning up in Africa does not say to me controlled ditching….but I’m no expert and don’t claim to be. It seems a lot of assumptions have been made and proclaimed as truth. Some interesting questions have been raised in this thread that have been ignored too. it appears as though this boys club doesn’t like newcomers too much asking questions. There seem to be a lot of different opinions on here, but no one really knows until the plane is found right? @bugsy – i remember seeing a pictures of the Asiana hard landing. Its flaperon was damaged very similarly but was not dislodged from the wing assembly in that impact. I remember Asiana B777 clipped the seawall then did a cartwheel with axis on one of the wings.. i just don’t see the flaperon separating unless hard impacting. >Also I take issue with Malaysia ignoring a commercial plane flying with its trxpndr off, don’t you find that odd. They ignored it because it was commercial and it was their airliner….how did he know it was their airliner if trxpnder was off and was only a blip on military radar screen? Sounds fishy to me. This is GREAT line of inquiry that has been widely overlooked. It generally gets chalked up to ‘asleep at the wheel’, ‘confusion’, ‘asian complacency’ (my favorite). And then the factual, proven lies by Hishammuddin get a pass by claiming he is ‘saving face’. That they were embarassed for being so incompetent, thus the subsequent fabrications and inconsistencies. It’s all BS. They knew the PIC Zaharie went dark and diverted almost from the get go. The writing was on the wall that this cat was a ticking time bomb. Others take issue with this assertion, but if one does a proper amount of homework on the guy, there is little to debate. Caveat: Hindsight being what it is. some new pictures of the interior cabin debris. The lavatory wall section (if that’s confirmed) tells us that the mounting probably fractured. The fact it got out implies a hull fracture or an open door. A ditching with flaps is about 130 knots; a ditching without flaps is about 210 knots. A nose in as described by some is in the order of anywhere from 400 to 600 knots or more. Any of the above could conceivably dislodge the lavatory mount point depending on conditions prevailing and also breach the hull. I would think the panel would look a lot smaller and worse for ware under the 400 knot plus scenario. A little bit of a “boy’s club” (as you describe it), possibly but crowdsourcing a considered opinion from quality providers. As for the message in the Data? It does’t make sense to anyone at the moment. However, the current (official) search location is utterly cold (after +2 years) with folk in Africa finding better evidence. All data needs to be re-evalued on face value, graded to its quality and source. >I would think the panel would look a lot smaller and worse for ware under the 400 knot plus scenario. I’m no structural engineer/aerospace engineer, but I actually know a few. And they think ‘flutter’ to be IMPOSSIBLE to explain away the condition AND the loss of the flaperon from the aeroplane, yet it gets endless traction here from the supposed aviation ‘experts’. And the DS ‘think tank’. WHY? Simply because it supports the inane, baseless and devoid of all logic assumption of a ‘ghost’ flight. A stubborn bunch. An ‘evil tiger spirit’ was having his day in court. DB Cooper was not after the cargo, the passengers, or the aircraft. He was only after the money. I said a commercial airliner has never been hijacked for the PAX or cargo. At least I could not find an example. The Asiana 214 left flaperon damage is not similar to the MH370 right flaperon damage. Asiana 214 left flaperon withstood a massive blow by striking ground but all primary attachments held while flaperon structures failed. Conversely, all MH370 primary attachments failed while flaperon structures held with the exception of the trailing edge and miscellaneous skin damage. Further information is available in the MH370 Flaperon Failure Analysis mentioned by link earlier on Jeff’s blog. ……… i’m no expert on this, but……..
On a closer look all this serves the purpose to strengthen its own theorie, controlled ditching or uncontrolled crashing. I do not see how this could help to find the airplane. While we (were) talking about seismic data I thought I’d post this having just found it among my old bookmarks. I don’t think it has much relevance but might be of interest to some. A lot of the old reports and articles I kept seem to have fallen into the 404 bin. Correct. The issue is controlled vs uncontrolled. Without pilot inputs after double flame-out the airplane is likely to have ended close to the 7th arc, whether with the ATSB’s low bank angle at 200 kt or with ALSM’s 90 degree bank at Mach 1. With pilot inputs the plane could have landed 100+ NM beyond the 7th arc and still have suffered a hull fracture or an open door at impact. Warren, have you been able to tie down exactly which door it was on the RH side that was forced in when the plane ditched? We are home and dry on the controlled ditching scenario. I think it was Mark Twain who said there are lies, dam lies (pardon me for swearing) and there are statistics. But joking apart, a statistical approach to problem solving can be very productive. This is what I mean – It’s two years since the accident, time enough for the recovery of a representative sample of the debris field. Now what debris have we actually got? We have a RH flaperon and a RH outboard flap inboard fairing fragment, which when still on the plane were a couple of metres apart. We also have a piece from the RH horizontal stabilizer upper surface, and a piece if engine cowling. The statistical chances of being in receipt of two adjacent parts of the RH wing trailing edge lift augmentation, and very little else is a great deal more than 4 to 1 against. I will leave it to the statisticians among us to have a go at working it out, but my guess is several hundred to one against. It’s not justifiable to consider the flap fairing and flaperon failure modes as individual unconnected events. They are both part of the RH lift control system, and they were adjacent to each other. In other words, what caused the one to be detached, also caused the other. Now I think we must all be in agreement that the flap fsiring couldn’t have been liable to flutter, so logically, neither could the flaperon. QED. And the partition panel, adjacent to a door, just serves to increase the odds further, not to mention the RH stabilized fragment. Thanks for your last response. I don’t know what made you upset, but please accept my apologies. I hoped to see more… more arguing rather than postulating and claiming. In fact I was somewhat surprised by your response. As long as you did not comment/answer/argue a number of my previous posts, some of which were particularly addressed to you, but instead continued postulating, my objections became shorter and sharper. In my opinion you opted for a dangerous road of taking assumptions as given facts. You question data, but for some reason believe in the correctness of assumptions. The first my question was the same as Oz asked you. At least you responded to him. Earlier I already explained my concerns with regard to this. If you had all the debris of this size, you indeed could make a conclusion about high-energy impact. If you have only a few pieces of similar characteristics (size, buoyancy, etc), what can you tell about size distribution of the debris at a crash site? Only forensic analysis might be able to answer whether the impact was of high energy or not. Based on residual deformations of metal, for example. Same about Curtin boom. There are many “booms” recorded by each station, similar to surface elevation “blips”. I can understand reasons why Curtin correlated a pair of booms at HA01 and RCS, but why Scott Reef? Curtin U. assumed that the set of events they selected was caused by the same reason. If this assumption is incorrect, then Maldives solution point does not stand. Instead of doubting correctness of this assumption made by Curtin U. and correctness of the assumptions made by ATSB/IG, you are doubting data. I don’t expect you to respond, but I hope you will. Dennis – I reckon Jahbat al Nusra or any other Islamist outfit would have trouble buying a 2nd hand 777 and 100 million could be much better spent on other stuff. Why not take one? Some Indonesian airline pilots have already disappeared into Syria-IS and the easiest one to take is the one you are flying. Do you have any links to the Curtin sound information that you wrote about? Dr. Duncan seems to be predominantly using the Cape Leeuwin station. re:your discussion if the plane was taken because the hypothetical hijackers needed a plane or maybe something valuable from the cargo – or even targeted some passengers: I think, it’s all possible. And arguing that something has never been done before in the history of plane hijacks, is treacherous ground IMO. Many things have happened and will happen for the first time. And especially in connection with mh370 nothing should surprise us anymore. If a scenario is sound and if it can be done it should be on the table. It doesn’t matter if something comparable has happened before or not. Well said. Being a fan of Taleb, I should know better than to argue from the standpoint of precedence. @Dennis, is Taleb the guy who coined the “Black Swan” terminus? Taleb wrote “The Black Swan” and a number of other books around the same theme. “Fooled by Randomness” and “Antifragile” are two of the better ones, IMO. I think we are all aware of that. but we should also be aware of the odds. The likelyhood of a crash without pilot input is quite some amount bigger than a controlled ditching attempt, wether it worked or it went wrong. The motives and events leading to a crash after fuel exhaustion are again manifold higher than the controlled ditching scenario. The evidence as BFO and aircraft behaviour, at least as I unsderstood them communicated by the ATSB and from simulator trials speak again for a crash short after fuel exhaustion. 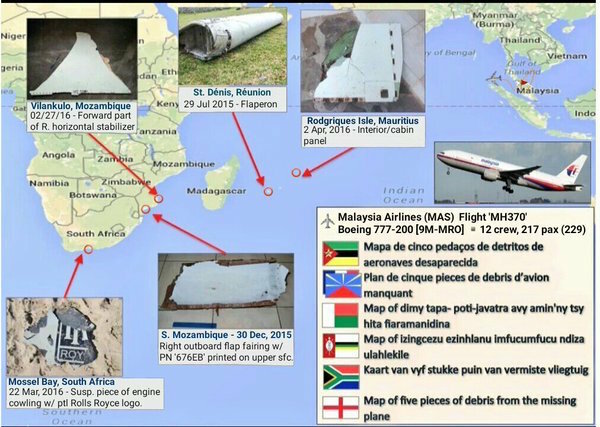 The absence of more found debris and the absence of detection of the aircraft in the present search area is most probably caused by searching far of the crash point instead just a bit away. It is either not on the seventh arc at all (less probable) or on a quite different latitude further to the north ( more probable). How can the forensic description of the possible crash scenario based on 4 pieces, accounting for about 0.05% of the aircraft be helpful in any way to solve the real puzzle? Not to talk, that these comments are not based on some expert knowledge with aircraft crash investigation expierience. I feel it more and more as being a distraction of the real problems and tasks we are faced with. I think it is safe to say all theories have been tested and tried out and none have passed for further investigation. You just don’t get it do you, or perhaps you just don’t want to. It’s exactly the fact that we do have these 4 pieces, comprising 0.5% of the aircraft, and no other 4 pieces, and that these 4 pieces point unequivocally to a specific crash scenario, that is the important thing. There have been numerous occasions in the past, before the arrival of the ubiquitous, and now indespensible black boxes, where crash investigators have had few bits of evidence to work with. Just consider this hypothetical situation – an experienced, professional crash nvestigator, with no agenda other than to determine the facts, is given a flaperon, flap track fairing from the same wing, two items that were in close proximity on the wing), a piece from the stabilizer (same side) and a piece of internal partition adjacent a door (same side) and precious little else, and is given the task of reconstructing the aircraft’s last moments. Do you think he would be able to reconstruct it’s last moments? You can bet your sweet bippy he could. @ROB: the door in question would be the #2R door, meaning it is the 2nd door from the front, on the right hand side. (I have seen another nomenclature where the doors are simply numbered from front-to-back, left-to-right, in which case it would be the #4 door). (The red “>>” symbol marks the exit position). As Gysbreght pointed out earlier, the bulkhead by the #3L door has a very similar configuration (also next to lavatory). However, it probably did not have the swinging table attachment, as the #3L door is for passenger embarkation, whereas the #2R door is a service entrance. 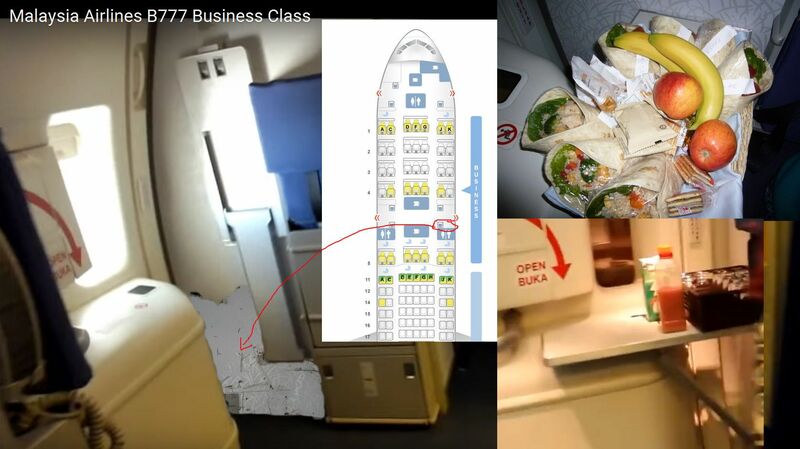 I was able to find a picture of a #3L 777 door showing the bulkhead, and it did NOT have the swinging table. However, this was a Delta Airlines aircraft; it could be possible that Malaysia is different, but I wouldn’t bet on it. 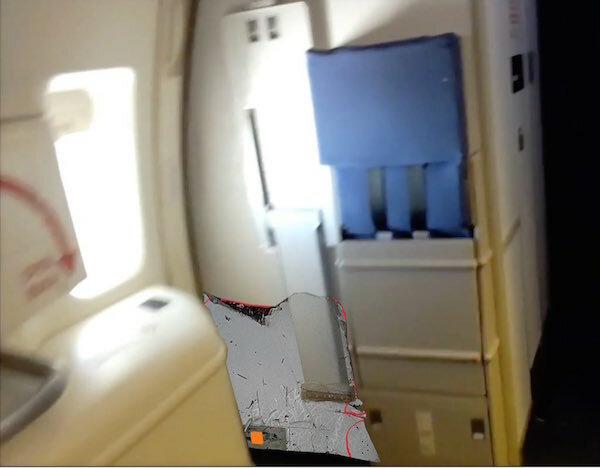 Since MH370 was pretty much at cruising altitude when things started to go haywire, the foldout table probably would have been deployed, blocking the #2R door. We could expect the table to remain in the same position for the rest of the flight. Thus, in the event of a right-handed cartwheel event that violently slammed the forward right-hand section of the fuselage into the water, if the door were to implode, then the first thing it would hit would be that table, possibly pulling the found fragment from its place on the lavatory bulkhead. @RetiredF4: It is best to just not worry about motives, and look at the physical facts, such as they are. The problem is that you are a normal person, so such motives will seem impossible to you. I would think it incomprehensible that a pilot would crash an airplane with numerous passengers because he was mad at his girlfriend. Yet Germanwings happened. There is precedent for all of the elements in a controlled flight input scenario for MH370; they are just not all wrapped up in the same package: suicide: Germanwings; stolen a/c ditched after running out of fuel: ET961; attempt to disappear: Craig D. Button. Now let’s consider the physical evidence. #1, the fact that there’s not a lot of it, is evidence that initial debris field did not consist of a lot of objects. Yet Duncan Steel et al. is telling us that there were 10,000 floating objects. Unless 99% of them subsequently sank(which I suppose is possible, and you will no doubt soon see a new article from Duncan Steel that will make exactly that point), we should have found a lot more debris objects by now. #2, the size of the debris found is larger than would typically be expected of a Mach 1 nose-in crash. There shouldn’t be anything bigger than a foot across, yet all objects found so far are bigger than that. #3, the flaperon: there is NO WAY it could be in the shape it is in as a result of a Mach 1, nose-in crash. Therefore, if such a crash occurred, the flaperon MUST have detached. But what is the evidence for that? Mr. Exner will point to his simulation experiment; Laurie H will point to the Silk Air incident. Weighing against these is that simulations don’t necessarily provide accurate results when conditions far exceed the normal envelope–I believe Byron Bailey’s flameout simulations had different results; and with Silk Air, there were controlled flight inputs that were responsible for the excessive speed. So, (a) we can’t say for sure that Mach 1 speeds were approached; and (b) even if they were, why should we expect the flaperon to detach? Because the flaperon is designed to be the high-speed aileron of the B777, and it is in about the most protected part of the wing it can be at, it would be the last item that would detach. Meanwhile, the damage to the trailing edge, no damage to front edge is consistent with a ditching attempt where the force of the water exerted strong rearward forces, pulling it from the wing. Also, the one word we’ve got from an actual French aviation expert privy to the French investigation says that it has some sort of a “twist” to it that leads them (or at least him) to the conclusion that it was probably an attempted ditching. The interior piece is problematic, but it does happen to be right next to that door. It had a swinging table that would have blocked that door. The door is on the right-hand side like everything else, and so if that door was pushed open, the table could have snapped of the fragment. Not a lot to go on, to be sure, but still, taken in it’s totality, the evidence suggests a low-energy, controlled flight input crash IMHO. ie: a strong torque, twist, breaking force with a claw or other gripper. The above is just for illustrative purposes as I have not found a photo of breakers working a wing. @Warren – You are correct that I used the information from the report on Silk Air 185 to propose that big pieces likely came detached before impact and the small pieces are a result of a very violent impact. 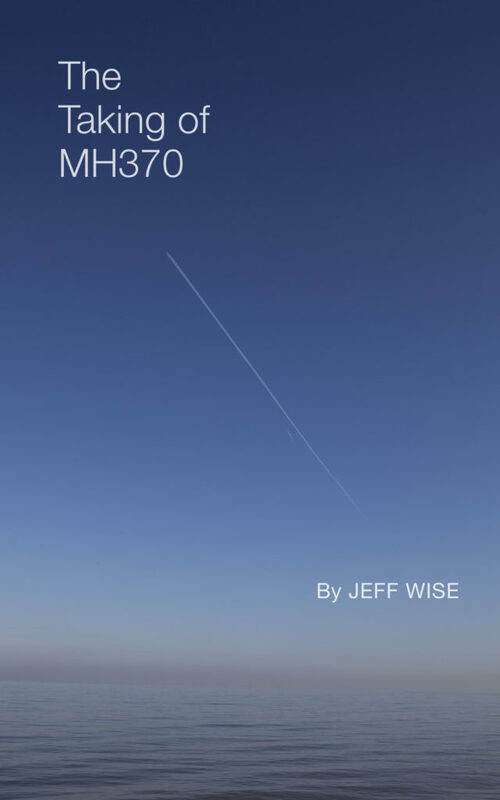 But the report on just one incident is probably not enough to conclude how MH370 came apart. I also used China Air 006, ET961, MS990 and US Airways 1549 to show the the damage resulting from impact with water. As a side note: The report on US Airways 1549 (The Miracle on the Hudson) stated it “experienced an almost complete loss of thrust in both engines” and “the fan rotors of both engines were rotating upon water impact.” These indicate that there might have been some thrust available to aid in the successful ditching. MH370 stole the top headlines from the conflicts in Ukraine at the time. Some also said it was satan letting us know “he” is here. When the co-pilot said the plane is disintegrating the plane vanished. It never flew back. The radar and satellite trackings followed a trap. Warren posted April 7, 2016 at 9:33 AM: “As Gysbreght pointed out earlier, the bulkhead by the #3L door has a very similar configuration (also next to lavatory). However, it probably did not have the swinging table attachment, as the #3L door is for passenger embarkation, whereas the #2R door is a service entrance. Firstly, the layout of the Delta Airlines cabin is different from that of Malaysian Airlines. The entrance door of the lavatories in the MAS layout is in line with outboard edge of the aisle and the inboard edge of the passenger seats. In the Delta layout the cabin attendant seats are mounted on the wall of some cabinet or storage space that does not protrude as far into the cabin as the MAS toilets, hence there is no room for the folding table. I didn’t see one near door 2R either. Secondly, the B777 has eight passenger entry doors. The doors on the right are the mirror image of those on the left, but are otherwise identical. The folding table is for use by the cabin attendant in flight, and is always folded up when the door is open, irrespective of whether the door is used by passengers or for servicing. The width of the passage is anyway limited by the attendant seat and not by the table folded against the wall. @Gysbreght: I didn’t “figure it out” because I don’t see what you are seeing. The bulkhead by the Delta 3R door and the MAS 2R door seem to be the same width–about two jump seat widths (both have jump seats). There is plenty of room for a table IMO. Where the symmetry breaks down is that both doors open to the front–which happens to be in the same direction as the main handle position when the door is closed. But when facing the bulkhead at #2R, you are looking aft; but if you are at #3L, you are looking forward, and the main handle is also pointing forward. This entails MAS cannot have a folding table at #3L even if they wanted to because the door handle would get in the way! You wouldn’t be able to lay the table down on the emergency slide box. I trust this lays to rest the location of the Rodrigues object. Re the flaperon: You had me there for a minute, and then I suddenly twigged. The folded-down table does not rest on the emergency slide box. Its support is folded up also. Its lower end is fixed against the wall by a piano hinge that is still present on the debris and on one image is seen folded open. The upper end of the support slides along a rail below the table as it is folded down. Whatever. It had a fold down table for sure, as the piano hinge proves. We know the door had to be on the RH side simply because it was the RH side that took the impact. Stands to reason. By the way, what exactly is “confirmation bias”? Your post is a perfect example. It is about 0.05% of the aircraft. Empty operating weight about 138.000Kg, debris weight estimated 70kg, go figure. It is your personal oppinion that this four pieces point to a specific crash scenario, which was created by your imagination. I’ve not heard any official version supporting it. There is not even an official version from which side the engine cowling piece or the stabilator piece came from, and neither where the cabin piece is from. All we have is non professional assesment from armchair investigators based on some pictures with bad quality. Yes, we hope they are working on the problem right now, and they will come up with the result when they have come to a conclusion with a reasonable amount of certinaty. I wonder why they did not call you and ask for your knowledge on that matter, as you did this “fact assesment” within hours, not days. He would say, that the aircraft obviously crashed, and then he will look and wait for further evidence and facts. He would be a poser if he could tell what you suggest. Why do you think that air crash investigations with all the evidence of a crash readily available on some smoking hole or an extended debris field are taking several month or even more than a year and include multiple experts with different fields of expertise? Maybe it is time you enlighten us what your specific expertise in air crash investigations , aircraft construction, aviation or similar area consists of. Maybe I might then be able “to get it”, although I doubt that you neither could provide such expertise nor that you would be able to convince me to jump to premature conclusions. You and all of us are entiteled to individual oppinions, but belitteling others who do not follow your genius is too much to bear. Using the bandwith for multiple repetitions of your personal assumptions while producing them as generally known facts is annoying. I hope I did not step over the set rules of this blog, if I did, I apologize in advance and accept if you delete this outbreak of criticism. Oh Brother. Lots of pedantry today! Yes of course I know how fold-down table works. You are technically correct that the emergency slide box does not support the weight of the table–the table only sits about a centimeter above the emergency slide box. Good point. The big fact that the handle of the #3L door would get in the way of a fold-down table remains untouched by your engineering lesson. I will point out that you are correct that there is nothing about the left side passenger doors per se that excludes such fold down tables. I understand that there is such a table at the 2L door. But again, because in that space you are facing aft, the handle of the door does not interfere with the fold-down action. Spare him Jeff, please, or I won’t sleep tonight. Thank you. I am greatly impressed by your eloquence. However, I reserve the right to keep my professional qualifications to myself, so I’m not going to embarrass you with them. @Retired F4, No, I think you put it quite well. @MH, It is interesting, isn’t it, that neither the French nor the Australians nor the Malaysians have breathed a word about what their mechanical examination of the debris has found, in terms of what kinds of forces created the debris? My thought was that it sits above the handle. Oh well, I may of course be wrong (unlike you). @Jeff: Well, Mssr. Grangier did say that the “twist” observed on the flaperon made him think of a ditching; that would seem imply rearward forces. One thing we should consider regarding forces is the fact that the decorative “foil”/wallpaper/decal stuff survived the impact at all. It seems to me that if the a/c hit the water nose-in at Mach 1, basically the entire front end of the a/c would crumple back. The first thing that would hit the bulkhead fragment is not the toilet behind it: it would have been the emergency slide/raft box first, toilet second. Yet there is decorative foil still surviving right where it would have hit the emergency slide/raft box.